For the first time in U.S. history, workers from an animal research laboratory are facing felony cruelty charges for animal abuse. A grand jury in North Carolina handed down 14 counts of cruelty to animals against four former lab workers, one of whom was a supervisor, at Professional Laboratory Research Services (PLRS). Scene from video taken at PLRS lab. 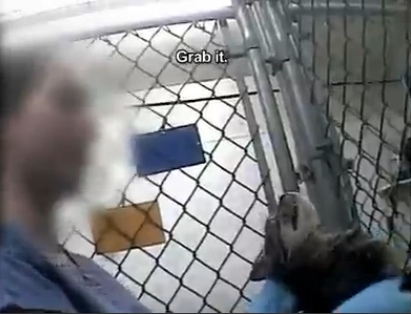 The cruelty was first brought to light last fall, when People for the Ethical Treatment of Animals (PETA) provided authorities with undercover video showing animal mistreatment at the lab. After federal officials began investigating the inhumane operation, nearly 200 dogs and more than 50 cats were removed from PLRS and the lab was closed in late 2010. "The accused are among those caught on video kicking, throwing, and dragging dogs; hoisting rabbits by their ears and puppies by their throats; violently slamming cats into cages; and screaming obscenities at terrified animals. One of those named is the worker seen on video trying to rip out a cat's claws by violently pulling the animal from the fence onto which he or she clung in fear." It is estimated that over 150 million vertebrate animals, including dogs, cats, mice, rabbits, guinea pigs, farm animals, and non-human primates, are used annually worldwide for testing purposes. In the U.S over 90% of animals used in experimentation are excluded from the Animal Welfare Act (AWA), the only federal law which oversees animal testing. Rats, mice, birds, reptiles, amphibians, and fish are expressly exempt from all safeguards. Species not covered under the AWA do not even have to be reported.